Mother's Day is upon us, and it's the perfect excuse to celebrate moms around the world -- including those of the animal kingdom. Here are some of the most fascinating, loving and downright delightful animal moms. 1. Opossum moms are better than a minivan. Opossums are known for giving birth to large litters -- and this one is no exception. A passerby spotted this momma with a whopping 15 babies clutching her fur. When the babies are younger, they live in their mom's pouch -- and then switch to her back for a ride as they grow up. 2. 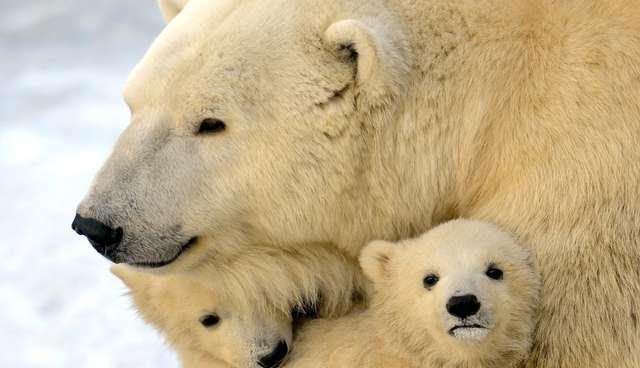 Polar bears moms sacrifice their lifestyle and freedom. Polar bear moms are some of the most dedicated ones out there -- they gain over 200 pounds and spend 9 months holed up in a tiny den in preparation for birth where Mom goes four to eight months without eating. She gives birth while in den isolation, then when Spring arrives around March, Mom leads her cubs out to the ice to hunt seals. This is the beginning of a two-and-a-half year period where the cubs stick closely by her side. 3. Orangutans' unbreakable, nurturing bond lasts decades. If you've ever seen a video of a baby orangutan clutching to her mother, you know they are close -- sometimes the baby can barely be seen nestled in her mom's fur. But this bond isn't just when they are young -- as orangutans grow, they learn everything from foraging to nest-building from their mothers. They spend six to seven years with mom, but even after they move out of the nest, female orangutans will often "visit" their mothers until they reach the age of 15 or 16. 4. Emperor penguins literally walk 50 miles for their babies. After she lays an egg, an emperor penguin mom will walk 50 miles to the ocean to catch fish and then return to regurgitate that fish to the hatched chick. The male, who has been keeping the chick warm while mom was away, passes the chick back to the feet of the female, who keeps him tucked close to her body to avoid the cold, which can kill a chick in just two minutes. Not only this, but a penguin mom has also been observed grieving for her young chick -- because they only lay one egg each year, the chicks are incredibly valuable to penguin moms. How could they not be, when they look like this? 5. Raising an elephant is a 16-year commitment and often takes a village. The largest land mammal on the earth has one of the strongest bonds between her calf. With the longest gestation period of any mammal (22 months), elephant moms nurse their calves for four to six years. Even after they are weaned, elephants stay with their mothers for about 16 years. 6. An octopus mom will starve herself for her babies. For most animals, just one baby to raise is enough. For octopuses, 200,000 is the mark to hit. In one of the astounding examples of altruism in the animal kingdom, she lays eggs just once, and guards the clutch ferociously. She cares for the eggs for one month, never leaving, not even for food. They have even been observed eating their own tentacles, rather than leaving their offspring. The eggs hatch and float away, while the mom will often die, starved or too weak to defend against predators. 7. Don't mess with a gator mom -- she carries her babies in her giant jaws. The inside of an alligator's mouth is not where an animal wants to be, unless you're an alligator hatchling. That's exactly where you want to be. Mom carries the gator babies in her mouth to protect them from predators like herons and skunks. She will stay with her babies for about a year, coming to protect them whenever they call out, and even providing free rides.